Aqib Talib is a cornerback for the Los Angeles Rams in the NFL. He is one of the most experienced players in the league in his position having been drafted in 2008. Talib is not only a seasoned player but also a successful one. In the course of his career, he has won a Super Bowl and has been elected to the Pro Bowl on five different occasions. Get to know more about the mercurial cornerback here including his bio, NFL career so far, wife and family, body stats etc. Aqib Talib was born on the 13th of February 1986 in Cleveland Ohio. The young Talib had his high school education at Lloyd V. Berkner High School in Dallas Texas where he was a multi-sport athlete, lettering in football, baseball, and track. As a senior, he was named the school’s defensive back of the year and also received first-team all-district and all-city defensive back honors. The high school football star received offers of athletic scholarships from several universities but pitched his tent with the University of Kansas. He spent a successful three years at Kansas (2005 to 2007) and amassed 162 tackles, 13 interceptions, 43 passes defended, two forced fumbles and two fumble recoveries in 34 career games. Talib crowned his college career with a superb MVP performance as his school defeated Virginia Tech to win the 2008 rose bowl. He was consequently named a consensus first-team All-American and unanimous first-team All-Big 12 Conference selection. Following a successful junior season, Talib decided to forgo his last season of college football in favor of the NFL. He took part in the 2008 NFL draft and was picked in the first round (20th overall) by the Tampa Bay Buccaneers who signed him to a four-year contract worth $14 million. In his rookie season, he appeared in 15 games (two starts) and contributed 27 tackles (19 solo), 4 interceptions (32 yds.) and nine passes defended. His first career interception was off a pass thrown by quarterback, Matt Ryan. Aqib Talib spent nearly five years with the Buccaneers, racking up 182 tackles (163 solo), 54 pass deflections and 18 interceptions in total. After five years with the Buccaneers, Talib was traded to the New England Patriots midway through the 2012 seasons. His one and a half year stint at the Patriots was successful, both at the team level and on a personal note. In the 2013 season, he started 13 games for the Patriots and tallied 40 tackles (33 solo), two interceptions, 10 passes defended and one fumble recovery as the Patriots made it to the playoffs. In recognition of his impressive individual contributions to the team, Talib was elected to his first career Pro Bowl and was named a second-team All-Pro by the Associated Press. In March 2014, Aqib Talib left the Patriots as a free agent and joined the Denver Broncos in a mouth-watering deal worth $57 million. There were initial misgivings by some fans and analysts about how large the amount was but Talib put those to rest with his impressive performances. In four years with the Broncos, he started all 58 games possible and amassed a total of 183 tackles (149 solo), 48 pass deflections, 11 interceptions (returned for 6 touchdowns) and two forced fumbles as the Broncos won Super Bowl 50. Talib was elected to the Pro Bowl in each of his four years with the Broncos and also earned his first career Associated Press All-Pro first-team honors in 2016 while with them. Aqib Talib also set a record as the first cornerback in NFL history to tally eight tackles, one interception and three passes defended in one single game. He achieved this feat in his first season with the Broncos. The footballer is currently playing for the L. A. Rams after being traded in March 2018. Looking back to how far he has come, it hasn’t been a smooth ride for him. In the early stages of his career, Talib was involved in a number of on-field and off-field incidents which could have easily derailed his career. In 2015, he poked a player in the eye and was given a one-game suspension. In the Super Bowl 50 championship game, he violently grabbed the face mask of another player and was fined. Also in June 2016, he shot himself in the leg and lied that he had been shot by another person. Talib is much calm headed now and credits his wife and kids for his maturity. Aqib Talib will see out the last two years of the 6-year deal he signed with the Broncos, at the L.A. Rams. The deal worth $57 million includes a $5 million in signing bonus, $25 million guaranteed, and an average annual salary of $9.5 million. Talib’s salary for 2018 is a cool $11 million. Aqib Talib comes from a family of six. It includes his dad, Theodore Henry and mom Donna Henry. His mom converted to Islam when he was young and subsequently gave all her children Muslim names. Talib has two older sisters, Saran, Kai and an elder brother named Yaqub. The NFL star is married to longtime girlfriend Gypsy Benitez. They were together for almost a decade before tying the knot on the 26th of March 2016. The lovely ceremony took place in Dallas and had many of Talib’s teammates (both past and present) in attendance. The beautiful couple has one kid together named Jabril. They also have a son Fabian (from Gypsy’s earlier relationship) and a daughter, Kiara (from Talib’s earlier relationship). 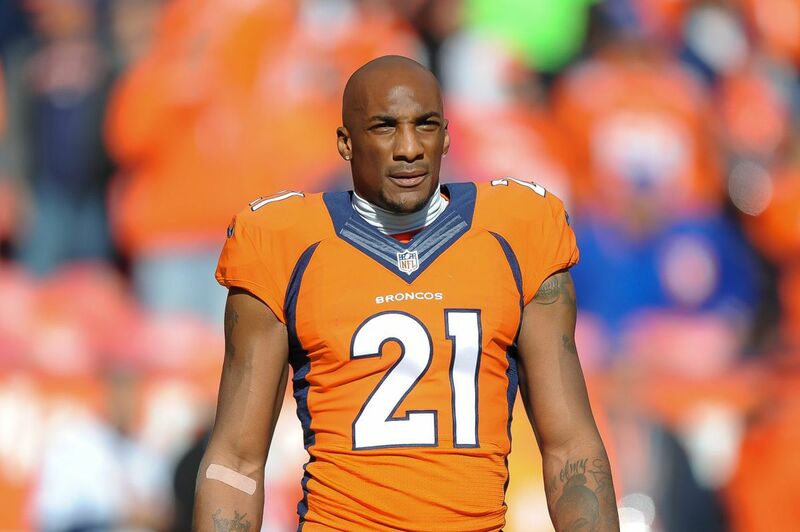 Aqib Talib is 6 feet 1 inch tall or 1.85 m and weighs 209lbs or 94kg. He uses his size and athleticism to get to the balls at the highest point and deflect passes.